Owning a car may be one of the keys to your success, especially in a place like High Point. High Point is the 9th most populous city in North Carolina, but it has characteristics that are usually found in larger cities. Getting a bad credit auto loan in High Point may be challenging, but definitely achievable if you take advantage of all the tools you have available. At CompleteAutoLoans.com, we specialize in connecting people with ratings to lenders that provide bad credit auto loans. Not only this, but we aim to connect you with lenders that provide fair terms. Some lenders even allow you to refinance your loan after a certain number of payments. That way, you won’t have to settle for low-quality vehicles or bad terms that hurt your credit over time! As we mentioned before, we aim to connect you to lenders that provide fair deals. That being said, our ultimate goal is to help you improve your credit. We also believe everyone should receive fair rates and reasonable terms, regardless of what they may or may not have done in the past. Because of this, there is no additional cost or charge related to our application tool or resources. All the tools available on our site are free of cost, so you can browse knowing you will not be subject to any hidden fees later on. There are several different details that will influence your decision to accept a loan offer. The two most important ones should be the total amount of the loan and the interest rates you’ll be receiving. As the name indicates, the total amount of the loan is the final cost of the entire transaction, including additional fees on behalf of the dealership and the lender. On the other hand, the interest rates you receive can vary depending on your salary, your credit score, and several other factors. Keep in mind that the lowest rates go to the people with the highest credit scores. If you want to get lower interest rates, you can choose to work on your credit and save up for a downpayment. This can improve your chances of getting approved for a loan and lower your monthly payments. Your credit score will be one of the most decisive factors when it comes to getting a loan. Despite the fact that we help connect you to bad credit auto loan providers, we also encourage you to work on your score before applying for a loan. By making all your payments in full and on time for the next few months, you can improve your credit score and get lower rates. At CompleteAutoLoans.com we also understand that you may need a vehicle urgently. In these cases, you can always take out car loans for bad credit and use them to improve your credit as well. As long as the lender allows it, you’ll be able to refinance your loan after a set number of consecutive payments. Refinancing can lower your costs significantly, but you have to make payments on time and in full. Not only this, but the payments you make are bound to have a positive effect on your overall credit rating. High Point is located in the Piedmont Triad, an area that is well-known for its economic potential. 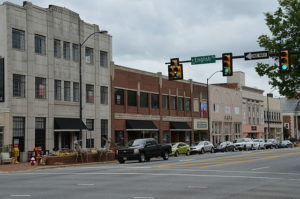 This area, which includes Greensboro and Winston-Salem, has gained a reputation for producing furniture and textiles, as well as for manufacturing buses. The local economy has diversified heavily, with industries such as telecommunications, banking, customer service, logistics, and general manufacturing. High Point has almost 118,000 residents and features an array of museums and cultural centers that are scattered throughout the city. If you are looking to get approved for a bad credit auto loan, you should be using all the tools at your disposal to get the best rates. At CompleteAutoLoans.com, we help connect lenders that specialize in providing car loans for bad credit to people who have low ratings. Take a look at our online application tool or learn more by visiting our resources page today!